A topic is a file containing information about a particular subject. Topics are the most important part of a Flare project. Everything else is contained within topics (e.g., cross-references, text, images) or points toward topics (e.g., tables of contents, indexes, browse sequences). The very reason end users open a Help system or manual is to find information, a little direction. They find that help within individual topics. At this moment, you are reading a topic (called "About Topics") that was created in Flare. Each topic is a separate XHTML file with an .htm extension. 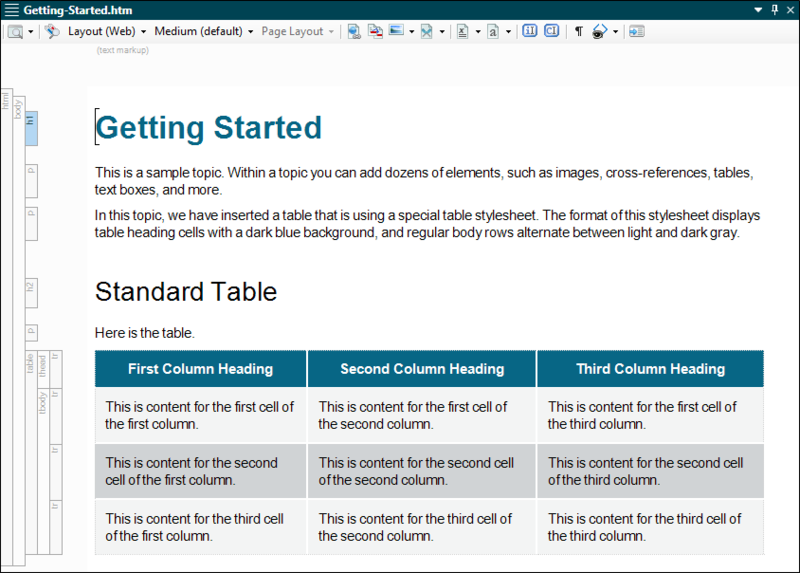 This enables you to take advantage of topic-based authoring. In other words, rather than creating a few very long documents (as you might do when working in a program such as Adobe FrameMaker or Microsoft Word), you create many small documents and then piece those separate files together to produce various outputs. Individual topic files are stored in the Content Explorer, either at the root level or in custom folders that you create. 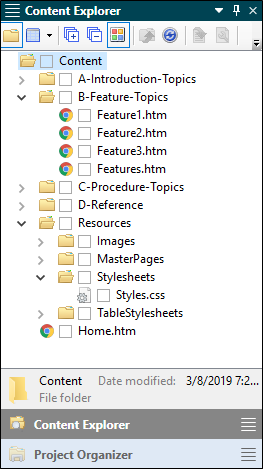 In your Flare project folder (you specified the location for the folder on your computer when you created the project), the topic files are stored in a subfolder called "Content." How big should a topic be? For online output, topics are like pages on a well-designed website. They should not be too long, but should be long enough to provide useful information. There is no specific rule for determining how long to make your topics. It is mostly a matter of common sense. When you are developing a topic, ask yourself if it is something that you would find useful and easy to read. If you have a topic that seems to be getting a little long, you can break the topic into smaller topics and provide hyperlinks from one topic to another. Another solution is to use Flare's DHTML features (drop-down text and expanding text) to collapse areas of text until end users click a hotspot to open the hidden text. You are currently reading content contained in a drop-down hotspot. When it comes to creating print-based output from Flare, these small topics can be strung together in the output to form larger chapters. It is recommended that you try to use small topics when working in Flare—usually no more than a few pages in output. Although you can certainly create a very long topic that holds all of the content for an entire chapter or manual, smaller topics allow you to take full advantage of Flare's many powerful single-sourcing features. For example, with small topics, you can reuse them when generating many different outputs, all from the same project. You might want to use some topics in some outputs, but not in others. With large documents, that is very difficult, if not impossible to do. In addition, small topics are much easier to send out to others for review. After you create a topic, you can add to it almost anything you want—text, tables, formatting styles, cross-references, images, multimedia, etc. It all depends on the needs of your audience. A topic can contain simple text, or it can contain a combination of many elements. A topic does not even need to contain much text at all; for example, you could simply use a topic to hold a Flash-based movie or a few lines of text for the title page in print-based output. You are only limited by what you can do with XML. If you are not familiar with XML, that's okay. You can use the easy XML Editor interface to edit topics in Flare, working much like you would in a program such as Microsoft Word. Flare creates the XML tags behind the scenes for you. Although Flare provides you with a user interface to work on topics (i.e., the XML Editor), you can get behind the scenes to see and edit the code for the topic. The easiest way to do this is to open the topic in the Internal Text Editor in Flare. To do this, open the topic as usual, then at the bottom of the XML Editor, click the Text Editor tab. You can also use split the editor between the XML Editor and the Internal Text Editor. See Internal Text Editor. You can also open topics in other third-party tools. One way to do this is to open the topic in Flare. Then click the Send To button in the Standard toolbar and select another editor. Note: Although it is possible to open any Flare files in a third-party editor, it is recommended that you avoid editing these files in certain programs while Flare is running. For example, opening a stylesheet in Notepad is not an issue. But you might experience problems if you open a topic or snippet in Microsoft Word and edit it while Flare is running. In addition to the regular topics that make up your chapter content, you can create special topics with a proxy (placeholder) for displaying generated content. These special topics are especially useful for print-based output and are often used for your manual's front matter and back matter. The most common type of generated content is a table of contents. Other kinds of output for which you can create topics include indexes, glossaries, endnotes, lists of elements, and lists of concepts. Standard Method See Creating Topics. 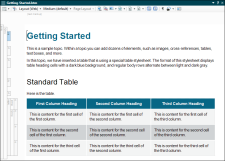 From Table of ContentsSee Creating New Topics from the TOC Editor. Importing From Word See Importing Word Files. Importing From FrameMaker See Importing FrameMaker Files. Importing From HTML See Importing HTML Files. Importing From DITA See Importing DITA Files.